The survivors of a two-boat collision at sea are relieved when they are picked up by a passing ship. They soon discover the danger is not over; this ship was once crewed by Nazis and carries their ghosts with it, searching for victims. The ship collision near the start of the movie, that sank the cruise liner carrying the survivors, was caused by the Death Ship in its ghostly mission to search for more victims. The former Nazi crew influence, tempt, and manipulate the survivors in chillingly macabre ways to get them to perform evil deeds on each other. It's as if the ghosts were attempting to turn the living into being just like them. The ship was a Nazi Kriegsmarine torture ship and floating SS concentration camp. Rotting corpses, skeletons, blood and body parts seem to be stored in hidden places all over the ship. World War II Nazi Germany flags and other symbols are all over the ship. There's even a German propaganda film of an Adolf Hitler speech in the ship theatre. The captain of the cruise ship, Ashland (George Kennedy), eventually became influenced by the evil spirits of the Death Ship crew. He dons a Nazi German naval captain uniform and tries to keep the other survivors hostage on the ship. He then tries to kill them all when the remaining survivors, the Marshall family (led by the father Trevor, played by Richard Crenna), put their escape plan into action. The captain is crushed to death by moving machinery in the ship when he tries to stop the survivors. 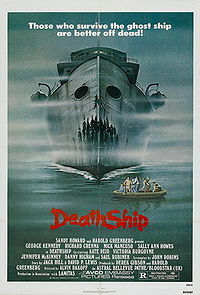 The Death Ship disobeyed the cruise ship captain and decided to sacrifice him to go after more victims elsewhere. At the end of the movie, the Marshalls are saved by a rescue helicopter while the Death Ship deliberately collides with another ship, suggesting that the whole nightmare will start again.